Canadians 50+ Respond to the Macleans Article "Seniors and the Generational Spending Gap"
I am writing as one of the people quoted in the article “Old and Loaded” by Tamsin McMahon. While I appreciate the amount of statistical detail and comment related to the generational spending gap that she included, I have serious concerns about the way in which the discussion was framed. Ms. McMahon notes that it is “easy to blame seniors for stacking the deck in favour of their own generation”. Unfortunately, however, this is precisely the trap that the article as a whole falls into by identifying the central issue as a generational war between an “old.rich.spoiled” affluent senior generation and younger Canadians. The cover image and the one-finger salute are both offensive to older Canadians and totally at odds with what I stressed in my interview – namely that as an supporter of Generation Squeeze (incidentally something not mentioned in the article) I am opposed to our public policy objectives for greater equity in the treatment of younger Canadians being achieved at the expense of the living standards, medical care and benefits currently enjoyed by seniors. This point was unfortunately not made in the article. A number of the comments are clearly reacting to what they perceive as the message that seniors are somehow to blame for, or at least indifferent to, the predicament of younger Canadians. The suggestion that “it’s high time they paid up”, possibly through claw backs, benefit cuts and means tests, suggests a zero-sum game which is contrary in spirit and substance to the vision of a Canada that works for all generations. Members of the 50+ community have a direct interest in seeing issues facing younger Canadian addressed not just individually (as many of us are already doing) but also collectively, without eroding the benefits and services enjoyed by retirees. Closing the generational spending gap should be viewed as an intergenerational priority, a social investment which directly contributes to the overall health and strength of Canadian society and all those who live in it. In the end, my hope is that Ms. McMahon’s article, for all its “battlefield” imagery, will nevertheless help to draw people’s attention to generational equity as a challenge of direct concern to all Canadians. I heartedly agree that there is a significant inequity between the average financial/living circumstances of older Canadians and those of the subsequent generations. As well, I heartedly agree that it is an issue that should be addressed sooner rather than later especially because it is already impacting young Canadians who are being raised in cash-strapped and frequently cramped homes by frazzled adults trying to be both high-quality parents and valued employees and often still burdened by student loans. 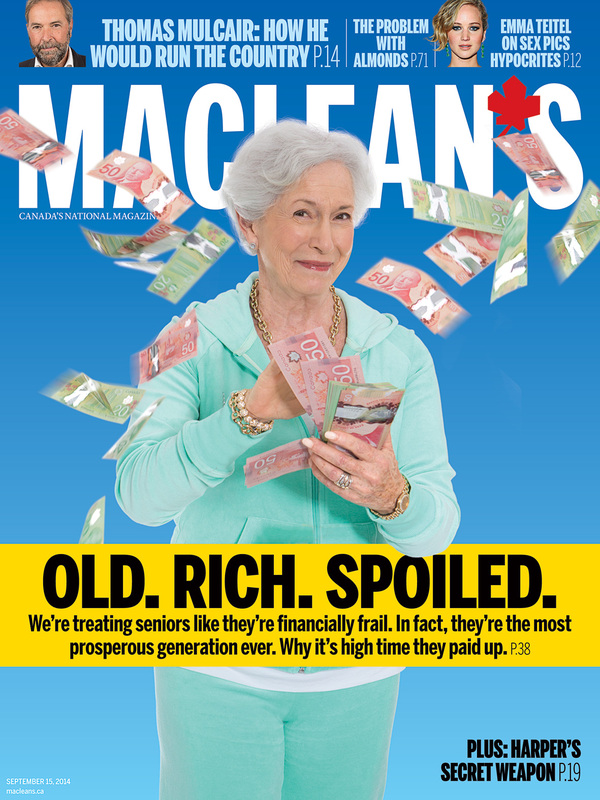 The Macleans article “Old and Loaded” could have been a laudatory expose of this serious, even critical, imbalance but I was DISMAYED by its “trimmings” – the front cover picture of an older person apparently throwing money around, the bold-typed cover caption “OLD. RICH. SPOILED”, the article’s title “Old and Loaded”, the elderly female arm giving the middle-finger salute, and the numerous references to war in the article. To date, most Canadian citizens and their governments are not aware of this significant inequality so they are not yet ready to recognize the impacts and consider potential options. Insulting Seniors/Boomers is not going to help. Instead, it engenders defensive positions and mitigates against people of those generations supporting government moves to re-jig social and financial policies in order to help the younger generations. Moreover, framing this inequity as a generational war only serves to make things worse. The younger generations are going to need backing from the older ones in order to (a) recognize that their needs are as significant as those who are vulnerable in the older generations (b) see the benefits of active participation in the political process and (c) persuade governments to risk making changes that are less-than-popular with the eligible voters who presently turn up at the polls. The “we vs. them” tone of the article works against the inter-generational awareness and cooperation that will be necessary, even crucial, to effect change. I applaud Generation Squeeze’s conscious efforts to avoid pitting the generations against each other and to seek increased funding for Generations X and Y, which does not involve clawing-back benefits already gained by the Senior & Boomer generations.